Once in a while, all domestic airlines start a price warfare. Tickets to popular destinations are sold at throw away prices, which mean travellers have a bonanza. Even frequent train travellers start thinking of the airline option. It is a win-win situation for all. A similar event happened early 2014. Sometime in January, all airline companies started this price battle. Obviously, some of our close friends got interested and started making elaborate plans. With the same motive, I had called a close friend to convince him about the plan. I still remember our conversation quite vividly. "Hey, do you know about the airline ticket rates going down? Others are thinking about a holiday plan sometime in April. So, what do you say, don't think we can get air tickets this low!! !” I explained to him, hoping he would buy into the plan. "Yeah, I know about it. ", he replied calmly. "That's good. By the way, I already bought tickets." "Yeah, I already had a plan with a tours-n-travels company. I thought why not now." Well, the other plan for April never took off, the air ticket prices had rocketed as well. So, eventually, I did join him. In fact, the tickets cost a lot more for me than what it cost for my friend. And it was just a matter of a day. So, that's how the plan to Goa took off. 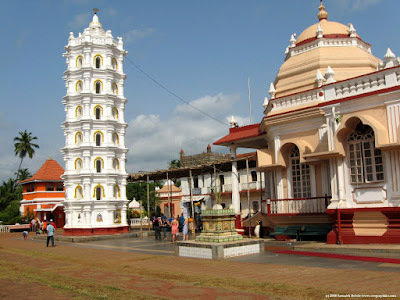 By train: Goa is well connected via two major stations Vasco-da-gama and Madgaon Junction. Trains from across the country travel to Goa on a frequent basis. For people travelling from Mumbai, there are plenty of trains from 2000 to 2300 hrs, which arrive next day at Madgaon early hours around 600-900 hrs. By air: Goa has an airport - Dabolim International airport. Flights from domestic as well as international shores arrive in Goa, which is quite popular with Indians as well as foreigners alike. 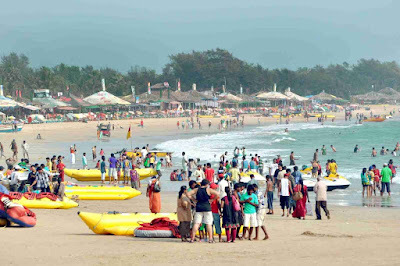 Goa is a premier holiday destination. As you reach the airport, the setting outside isn't that great. There is a small restaurant just outside. One may have light snacks and cool drinks. There is the usual chaos of taxi drivers outside, with each one trying to lure you in to take their taxi. Government must take certain steps to curtail such behaviour, when dealing with tourists, especially foreigners. It shows our country in poor light. Unfortunately, except for Kerala, I have found it to be the same outside airports and even railway stations. There is a pre-paid taxi counter as well. We took one which cost us Rs.900* to Mapusa, that's where our hotel was. Although, rented scooters are best way to roam around the place, we had opted for a taxi. White coloured taxis with yellow registration plates, that is the signature of a tourist taxi in Goa. 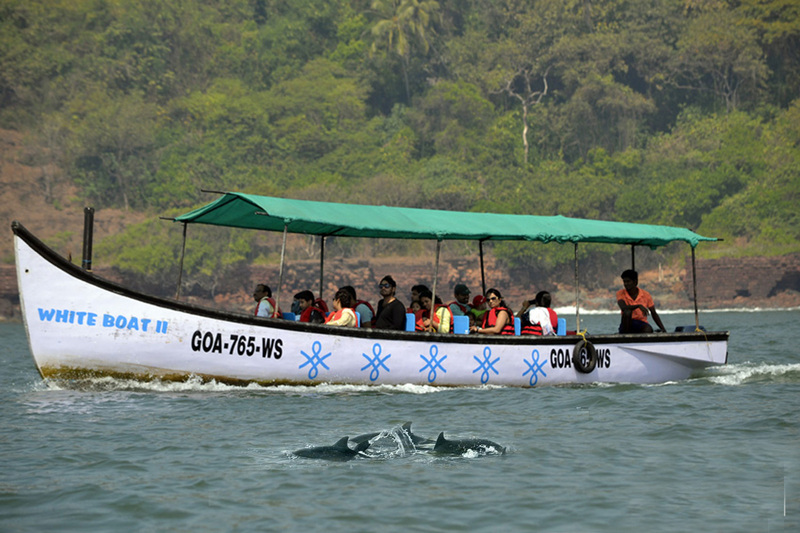 You get tour packages with such tourist taxis for all major tourist destinations in North & South Goa. 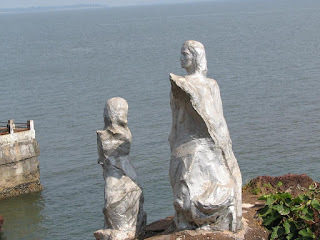 Our first leg of sightseeing started with North Goa. We started our journey after having a nice sumptuous breakfast at our hotel. 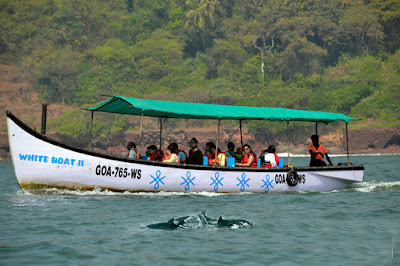 Our first sightseeing was at a place which Goa is known for - the high seas. We had gone for a unique boat ride. Soon we arrived at the jetty. We took the tickets for the boat ride. The tickets for the boat ride cost us Rs. 50* per person. We were provided with bright orange coloured life jackets. It was a 12-seater motor boat. There were two boatmen, who helped us get on the boat. We were seated at the back side of the boat. As the boat started, we got all excited, purely, due to the unique nature of the boat ride. 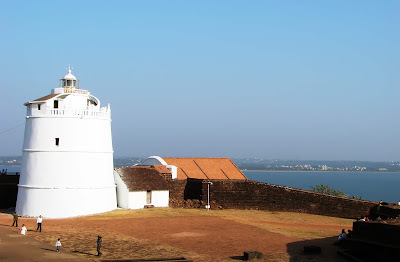 Next up was the much talked about early 17th century Portuguese fort - Aguada fort. We treated ourselves to some fresh lime juice just outside the fort entrance. It was really a much-needed energy tonic, especially in the sweltering heat. There were shops selling juices, cold drinks, fruits, cucumber, hats & even clothes. We got ourselves some hats. Much like the state of most forts in India, there was no specific entrance so to speak. People just started walking through a wide-open space. We could see a few walls made of large stone bricks. With a few turns here and there, we are in the middle of a massive court yard. The fort built by the Portuguese served as a bastion to guard against any invasions from the Marathas and the dutch. 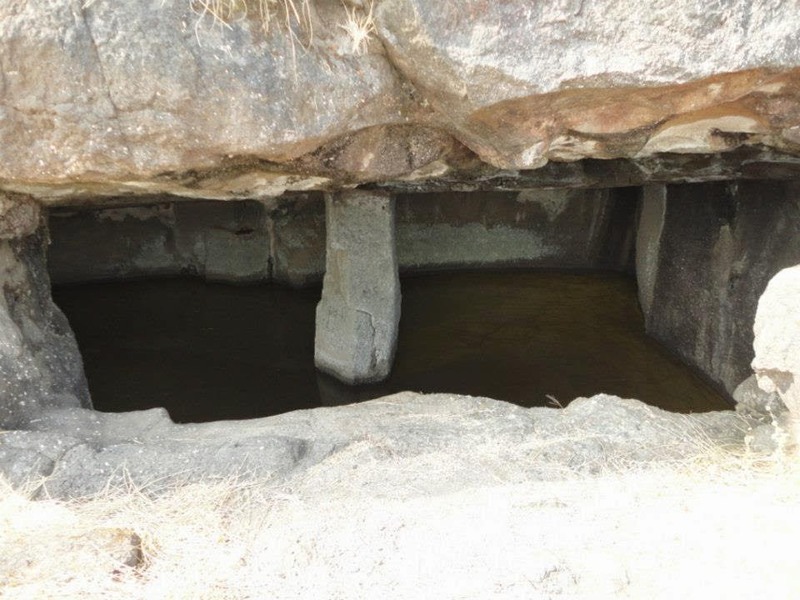 The fort was named after the Portuguese word ‘Agua’ meaning water; it was named so because the area around the fort was rich with freshwater springs which supplied water to the ships that stopped by. It also contained a light tower, modernised in 1976. The lighthouse on the fort is oldest of its kind in Asia and offers breath-taking panoramic view of lush greenery and beautiful ocean. The view of Arabian sea from the fort was breath taking to say the least. Several Bollywood movies are shot at Fort Aguada, making it a popular destination for Hindi film buffs along with history loving tourists. Calunghute, Baga, Anjuna, Vagator : The rest of the day was spent visiting the four famous beaches of North Goa. Although, more time could have been spent on each of the beaches, however, we were on a tight schedule & had to wrap up North Goa in a day. Each of the beaches had their own distinct character that separated one from the other. Calunghute and Baga appeared to be the most commercial of the beaches. The entrance of Calunghute had a vast expanse of shops on either side of the road leading to the entrance. Shops selling variety of goods right from clothes, hats to even local liquor. No prizes for guessing which shops attracted most crowds. The beach had lots of activity going on. There was an array of shacks spread out over the beach serving drinks, snacks for beach revellers. 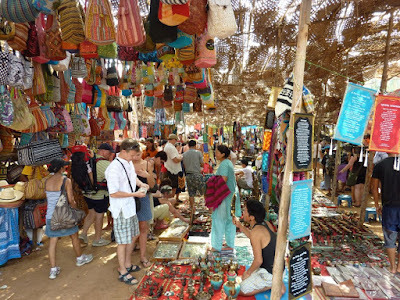 We didn't spend too much time at Calunghute, so we moved to the next one - Baga beach. There is no clear demarcation as to where Calunghute ends and Baga starts. One of the most popular of the beaches of North Goa, Baga offered adventure sports like para gliding and para sailing, motor boats. Unlike other beaches, Baga had a lot of foreigners sunbathing. Naturally, we decided to wind off at Baga. We took a shack and spent some time relaxing on the beach. There were some sea guards in their jeeps keeping a close watch for any untoward accident, since the tides were getting bigger. The atmosphere was like a party with the neighbouring restaurants playing loud music. After spending some time at Baga, we decided to move on. The next two beaches Anjuna & Vagator were not as loud as the prior two. However, they were lot picturesque than them, the kind of beaches where you would sit back and just watch the waves. For Anjuna, you need to climb down the cliff, as the sea is down below, battering the rocks. Most people would settle on the rocks enjoying the sea breeze with waves kissing one's feet. There are lots of shops at the top. We treated ourselves to some cold drinks and refreshing lime juice. 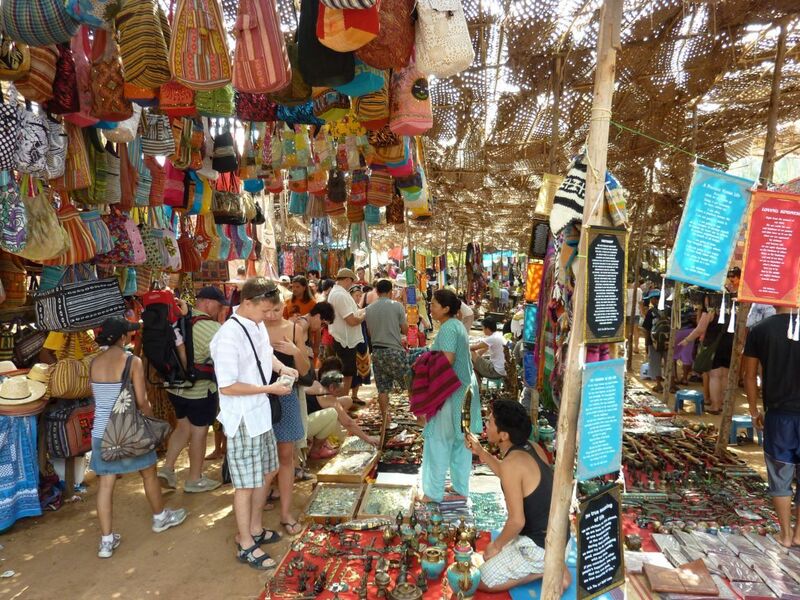 Anjuna is famous for its flea market. Although, we didn't go to the market, it is open only on Wednesdays. However, I would recommend to check with the locals, in case it is open on other days. Then, we went to the final beach of the day - Vagator. It certainly wasn't the biggest of the beaches, we graced that day. However, there was a unique feel to the beach. Probably, the calmest of the lot. Didn't find any shacks. The best thing about the beach was the breeze. It was already past dusk when we reached Vagator. So, it was slightly getting chillier when we were at the beach. We spent some time at the beach before moving on. The next day was spent visiting South Goa. 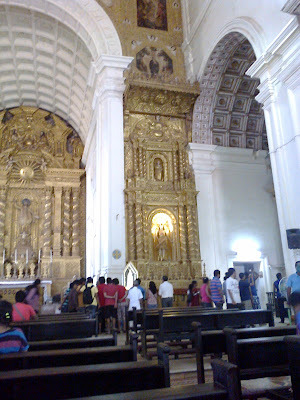 We visited one of the finest examples of Jesuit architectures - the basilica of Bom Jesus church. The title 'Basilica' is bestowed upon large churches that are important as places of pilgrimage or for a specific devotion such as to a saint. In this church, the saint happens to be 16th century saint St.Francis Xavier, whose mortal remains are present there. The body is kept for public viewing every 10 years (last kept in 2014). As we approached the church, there were urchins selling some candles. We took a few of them & entered the church. We lit the candles in one of the inner chambers. The architecture inside was quite unique. We could see the body kept in a casket at a height. Although, the church is not in the best of shapes, but, it was far better considering the era in which it was built in. 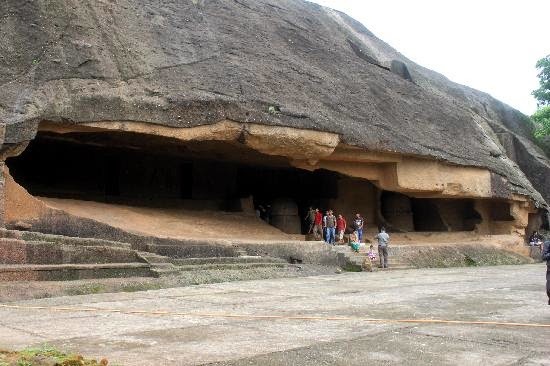 Even present day, it attracts thousands of visitors. Mangeshi temple: Next stop was the famous Mangeshi temple. We reached Mangeshi temple going through some old narrow lanes. As with any other temples, there were shops selling flowers, prasad outside. We took some flowers from an old lady and climbed the stairs to the temple. There was a shoe stand where we left our footwear. That's when we realised, how hot it was that day, it almost burnt our feet. The temple had this tall structure called deepstambha in front of it, within the temple complex. As we went inside the temple, we found there was a puja going on. The temple was in a good shape, especially considering it to be a 400-year-old temple. It gave a glimpse of the pre-Portuguese days of old Goa, which can barely be seen nowadays. 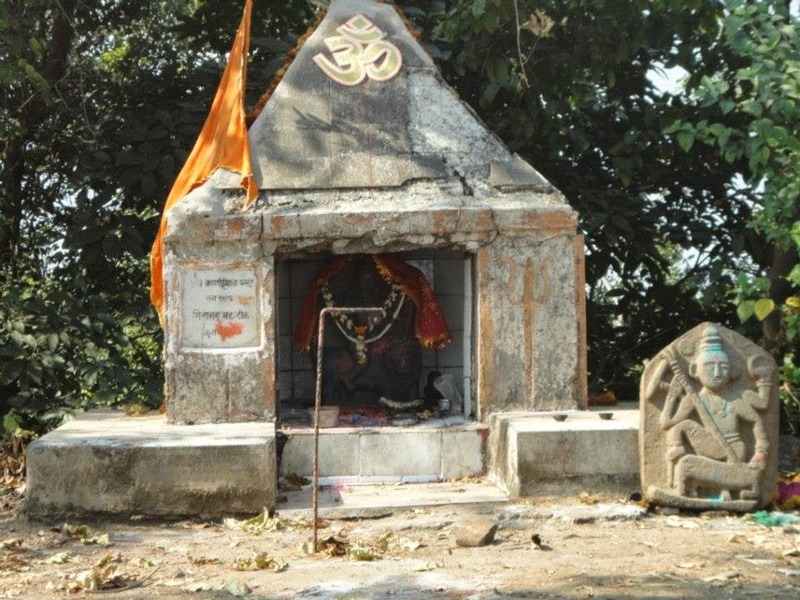 Dedicated to Lord Shiva, this temple has a prominent Nandi bull. After our share of prayers, we got down, spent some time eating some raw mango pieces and some बोर fruit with a glass of fresh lime juice to wash it down. Yeah, we kept ourselves well hydrated throughout our trip. Panjim jetty Afternoon was spent shopping and having our meals at restaurants near Panjim jetty. There were some ships along Panjim jetty, well, can't call them ships, as they were not big enough for ships, but can’t call them boats either, as they were bigger than boats. Gambling is permitted in Goa, these boats had these huge casinos on them. One had to purchase tickets to those casinos to enter. Obviously, we had no interests to part with our money, we chose to give it a miss. Donna Paula jetty Then we visited the famous Donna Paula jetty, especially for young ones and couples. It's also called the lover's paradise. There are a lot of mysterious stories about a lady named Donna Paula, after whom the jetty was named. One legend has it that she was the lady-in-waiting of the Governor-General's wife, and in course of time the Governor fell victim to her beauty and charms. They were found out and the governor's enraged wife had her stripped and bound and rolled over the cliff, into the sea, wearing only her string of pearls, a gift of love from the Governor. The fishermen of the area have a marvellous collection of ghost stories about Donna Paula. On moonlit nights, they say, on pitch dark nights, say others at the stroke of midnight, she rises from the sea and roams the area, wearing a string of pearls and nothing else. Seems straight out of a Bollywood plot. As a matter of fact, the famous movie of yesteryear Ek Duje Ke Liye was shot there. Miramar beach - And finally, we reached the Miramar beach. 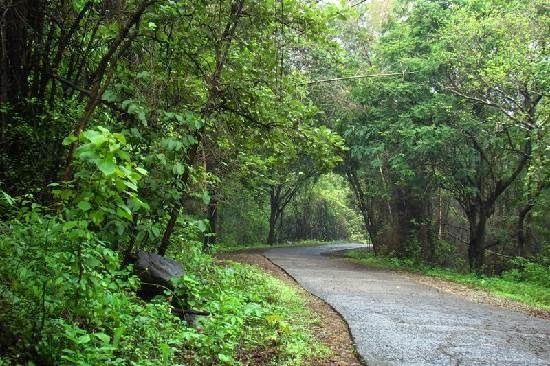 It can be reached easily, as it is well connected to the main road unlike other beaches of Goa. There is a large structure of a fish at the entrance of the beach. Obviously, we had to take some pictures around it. The beach itself was quite wide, slightly less populated than the other beaches we visited the previous day. Must say, it was much cleaner than the other beaches. We were just in time to see the sun go down, and with that our short trip to Goa. Enjoy Goa !!! Enjoy Travel !! !